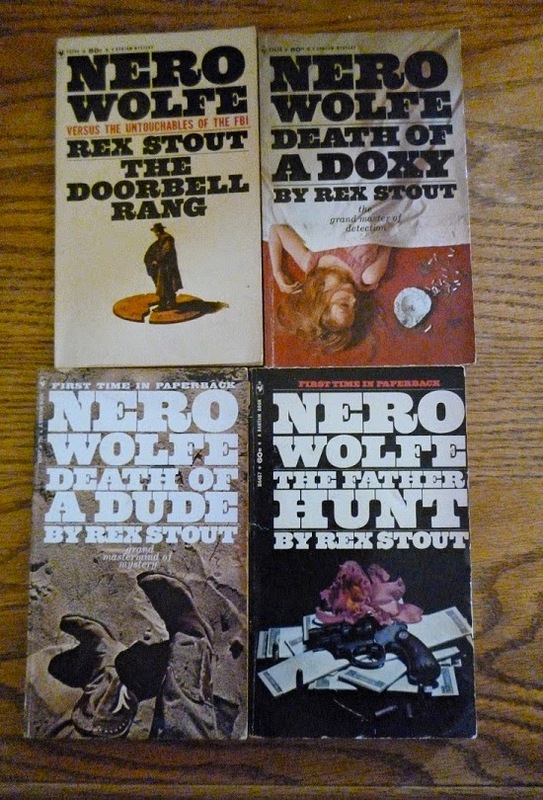 This is the ninth installment of the Nero Wolfe Project. In this post, we're looking at The Doorbell Rang, Death of a Doxy, The Father Hunt, and Death of a Dude. The Doorbell Rang is arguably Stout's best-known work. After reading a (real-life) book, The FBI Nobody Knows by Fred J. Cook, a rich woman contacts Wolfe concerning her relations with the FBI. She had purchased 10,000 copies of that book and sent them to prominent people across the United States, including government officials, and now she feels as if she is under surveillance. Wolfe takes the case, having read the book, in return for a huge retainer. Archie, initially ambivalent at such an open-ended prospect with a huge organization such as the FBI, soon falls in line, especially after Inspector Cramer meets with Archie secretly. Cramer has an unsolved murder that he believes was the work of the FBI, and--after getting a request from the FBI to revoke Wolfe and Archie's licenses--knows that something is up. The pair soon solve the murder, but also plan an elaborate trap to embarrass the FBI. Then begins a showdown between Wolfe, Cramer, the FBI, and the murder suspect. This is not only one of Stout's most famous works, but in many ways his most politically charged. Generally speaking, aside from offhand statements, Stout largely strayed away from politics in his books, notable especially given his real-life reputation. This was an exception; it's a broadside fire against the FBI as an institution, and the time frame (1965) was when the FBI (and J. Edgar Hoover specifically) was just starting to come under heavy criticism. At first, it seems a little awkward--the impression one gets is that the client is there just to set up a situation where Wolfe/Stout can pen an anti-FBI screed. But it soon melds into both a standard murder mystery and reasonably seamlessly weaves in the FBI's involvement. In many ways, it's a refreshing change of pace: Cramer is largely acting in good faith; Wolfe is practically jubilant at the end (more than just "very satisfactory"), and the writing is tight and top-notch. Some of the individuals are acting out of character (justifiably, given the situation), it's hard to recommend this as an initial book to read. But otherwise is one of the best. In Death of a Doxy, Orrie Cather is implicated in the death of a woman. She was upset that Orrie was going to marry another woman, and used a fake pregnancy to pressure him into leaving her. When she winds up dead, or course, Orrie is the main suspect. Wolfe--along with Archie, Saul, and Fred--can't imagine that he would do such a thing. When it turns out the victim was the mistress of an extraordinarily wealthy man, Wolfe has to go through great pains to prevent his identity being known--not only because it would cause their case to fall apart (although it would free Orrie) but also because of a promised fee. Wolfe and Archie weave an intricate tale that manages to find the murderer while also protecting different individuals from getting different information. In The Father Hunt, a young woman approaches Wolfe about finding her true father--and after he finds out her father has (indirectly) been sending her immense amounts of cash, they undertake the case. The cash was sent after her mother's death, which ended up being a hit-and-run, so (of course) murder is involved. After their first two attempts at finding the father fail, a rigorous interview with a former colleague nets a small piece of information that soon allows them to let everything fall into place. This book sounds like it will be a companion piece to The Mother Hunt, but they are quite different. Notable in this book is the increased presence of evidence detection--paternity and advanced fingerprinting is mentioned. Again, the conclusion is solidly constructed and the plot moves quickly. Death of a Dude is one of the longer, more complex mysteries (albiet only about 30 pages longer than most other novels). Archie is spending his month off with Lily Rowan in Montana, only to have a local man murdered. Archie, convinced he is innocent, writes Wolfe to say he's taking a leave of absence; this, of course, prompts Wolfe to make a cross-country trip to help out. Being away from the brownstone complicates things, as the local police and attorneys know little of his reputation and chafe against his non-Montananess. Things come to a head when yet another man is murdered and Archie is thrown in jail. A little help from Saul, and Wolfe and Archie manage to catch the killer. While this is a fantastic story from a character development standpoint--having Lily around helps things out--and having everyone out of their element is fun, the murder mystery itself isn't terribly satisfying. Still, who cares? The threadbare evidence is simply a frame with which to hang everything else at this point.